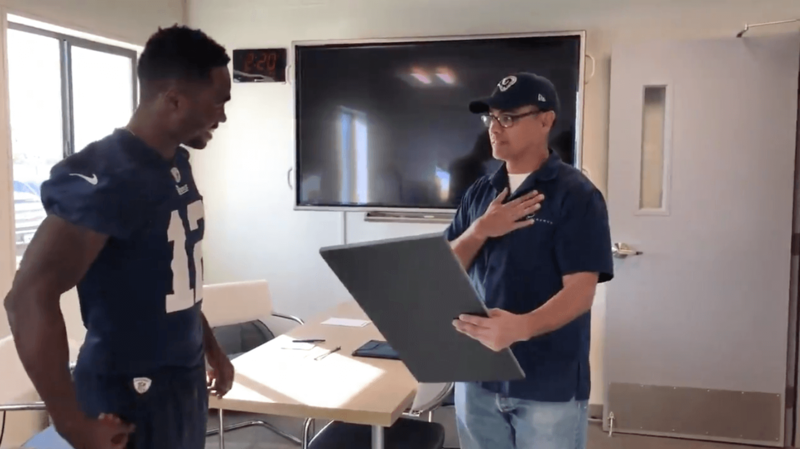 Los Angeles Rams wide receiver Brandin Cooks gave team custodian Alfonso Garcia the gift of a lifetime: a surprise trip for him and his son to Super Bowl LIII. Cooks presented an overwhelmed Garcia with the gift in a moment caught on camera and posted to the Rams' Twitter account. The trip includes free tickets to the Super Bowl for Garcia and his son as well as an all-inclusive hotel stay for the weekend in Atlanta. Cooks said to USA Today of Garcia, "Oh, man, Alfonso — the guy is special, man. He keeps our locker room in tip-top shape. He has such a special soul." Whether or not the Rams earn their victory on Sunday, Garcia will certainly count himself a winner, and we count Brandin Cooks as one, too.